Earlier the PKK attacked Turkish troops in an ambush on a bridge killing at least 12, and tensions are rising both sides of the border. Turkey recently passed a bill allowing attacks across the border in Iraq, and there are reports that they are shelling in Iraq again. This cannot continue — while PKK are terrorists and must be wiped out, shelling villages or an incursion into Iraq is not the way to go about it. Iraq is a sovereign nation, and if Turkey invades, then Iraq, and all their allies have the right to strike back. I found this cartoon in Echourouk Online, and just had to carry it. It’s a great piece of work on several levels. 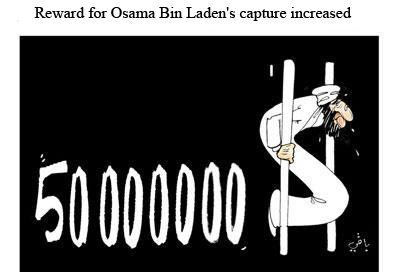 It parodies Al Qaeda’s flag, shows the reward is raised, and implies that not only is Bin Laden fearful and running away, but aslo crippled — which goes back to the rumors from September before last that had him diseased, ill, and paralyzed below the waist. Full political rallies have been banned in the Punjab, which will put a damper on all campaigns, but even without the ban rally turn out would likely be low in the wake of the suicide bombing. As the previous post demonstrates, police released the photo of the suicide bombers’s head, and shortly afterwards made three arrests in the investigation into the bombing attack on Benazir’s motorcade. Benazir and many party officials visited those wounded in the blasts, and PPP has announced that they will pay the medical expenses of all who were injured in the blasts. 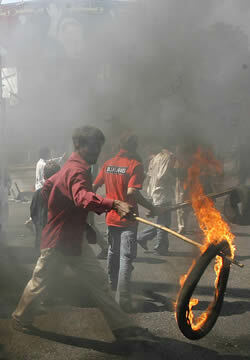 Benazir Bhutto’s supporters are undeterred in the wake of the blast, and Jiyalas in the Sindh are requesting visits. Against this backdrop and what is happening in the frontiers it’s all too easy to predict dire things for Pakistan’s future, but I am not going to join that parade. Over time all things get better – it is the nature of human existence and history. Namira contrasts what can be with things that are as a contrast. The economy is better, freedoms are improving, there are fewer people who starve than there used to be, infant mortality is improving, and education is improving. It’s easy to be grim, so much harder to be patient, persistent, and to work for good in the face of evil. There are Pakistani’s who do that day in, day out, without notice or credit. They create, they do not destroy — I have utmost faith and confidence in those who create — they always better things over time.